German physicist and philosopher remembered for his Uncertainty Principle (1927) and other developments in quantum mechanics. 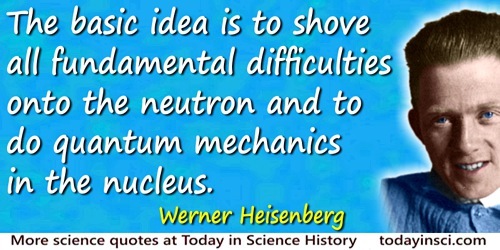 He was awarded the 1932 Nobel Prize for Physics. Ein Fachmann ist ein Mann, der einige der gröbsten Fehler kennt, die man in dem betreffenden Fach machen kann, und der sie deshalb zu vermeiden versteht. From the original German, “Ein Fachmann ist ein Mann, der einige der gröbsten Fehler kennt, die man in dem betreffenden Fach machen kann, und der sie deshalb zu vermeiden versteht”, in Der Teil und das Ganze: Gespräche im Umkreis der Atomphysik (The Part and the Whole: Conversations in the Atomic Physics) (1969, 2001), 247. Excerpt in magazine article, 'Kein Chaos, aus dem nicht wieder Ordnung würde,' Die Zeit (22 August 1969), 34. English version in Werner Heisenberg and Arnold J. Pomerans (trans. ), Physics and Beyond: Encounters and Conversations (1971), 210. Physics and Beyond: Encounters and Conversations, trans. Arnold J. Pomerans (1971), 78. 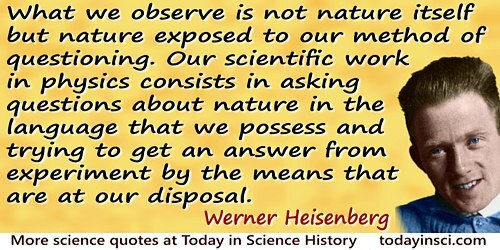 Even in science the object of research is no longer nature itself, but man’s investigation of nature. In The Physicist's Conception of Nature (1958), 24. I believe that certain erroneous developments in particle theory ... are caused by a misconception by some physicists that it is possible to avoid philosophical arguments altogether. Starting with poor philosophy, they pose the wrong questions. It is only a slight exaggeration to say that good physics has at times been spoiled by poor philosophy. I remember discussions with Bohr which went through many hours till very late at night and ended almost in despair; and when at the end of the discussion I went alone for a walk in the neighboring park I repeated to myself again and again the question: Can nature possibly be as absurd as it seemed to us in these atomic experiments? In Physics and Philosophy: The Revolution in Modern Science (1958, 1962), 42. 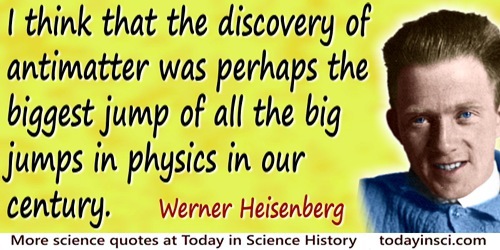 I think that the discovery of antimatter was perhaps the biggest jump of all the big jumps in physics in our century. From 'Development of Concepts in the History of Quantum Theory', in Jagdish Mehra (ed.) The Physicist's Concept of Nature (1973), Vol. 1972, 271. In general, scientific progress calls for no more than the absorption and elaboration of new ideas—and this is a call most scientists are happy to heed. In Werner Heisenberg and Arnold J. Pomerans (trans. ), Physics and Beyond: Encounters and Conversations (1971), 70. In the strict formulation of the law of causality—if we know the present, we can calculate the future—it is not the conclusion that is wrong but the premise. On an implication of the uncertainty principle. Quoted in David C. Cassidy, Beyond Uncertainty: Heisenberg, Quantum Physics, and the Bomb (2009), 162. It seems sensible to discard all hope of observing hitherto unobservable quantities, such as the position and period of the electron... Instead it seems more reasonable to try to establish a theoretical quantum mechanics, analogous to classical mechanics, but in which only relations between observable quantities occur. In Helge Kragh, Quantum Generations: A History of Physics in the Twentieth Century (1999), 161. Modern physics has changed nothing in the great classical disciplines of, for instance, mechanics, optics, and heat. Only the conception of hitherto unexplored regions, formed prematurely from a knowledge of only certain parts of the world, has undergone a decisive transformation. This conception, however, is always decisive for the future course of research. In Philosophical Problems of Nuclear Science: Eight Lectures (1952), 18. Nature is made in such a way as to be able to be understood. Or perhaps I should put it—more correctly—the other way around, and say that we are made in such a way as to be able to understand Nature. Our scientific work in physics consists in asking questions about nature in the language that we possess and trying to get an answer from experiment by the means at our disposal. In this way quantum theory reminds us, as Bohr has put it, of the old wisdom that when searching for harmony in life one must never forget that in the drama of existence we are ourselves both players and spectators. It is understandable that in our scientific relation to nature our own activity becomes very important when we have to deal with parts of nature into which we can penetrate only by using the most elaborate tools. The Copenhagen Interpretation of Quantum Theory (1958). In Steve Adams, Frontiers (2000), 13. Science no longer is in the position of observer of nature, but rather recognizes itself as part of the interplay between man and nature. The scientific method ... changes and transforms its object: the procedure can no longer keep its distance from the object. The Representation of Nature in Contemporary Physics', Symbolism in Religion and Literature (1960), 231. Cited in John J. Stuhr, Philosophy and the Reconstruction of Culture (1993), 139. Since the measuring device has been constructed by the observer … we have to remember that what we observe is not nature itself but nature exposed to our method of questioning. Our scientific work in physics consists in asking questions about nature in the language that we possess and trying to get an answer from experiment by the means that are at our disposal. Physics and Philosophy: The Revolution in Modern Science (1958), 78. 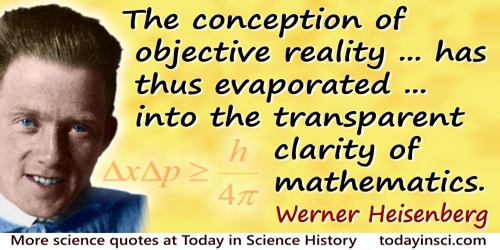 The conception of objective reality … has thus evaporated … into the transparent clarity of mathematics that represents no longer the behavior of particles but rather our knowledge of this behavior. In 'The Representation of Nature in Contemporary Physics', Daedalus (1958), 87, 95-108. As cited in Karl Popper, Quantum Theory and the Schism in Physics (1992), 85. The hope that new experiments will lead us back to objective events in time and space is about as well founded as the hope of discovering the end of the world in the unexplored regions of the Antarctic. The mathematically formulated laws of quantum theory show clearly that our ordinary intuitive concepts cannot be unambiguously applied to the smallest particles. All the words or concepts we use to describe ordinary physical objects, such as position, velocity, color, size, and so on, become indefinite and problematic if we try to use them of elementary particles. In Across the Frontiers (1974), 114. The more I think about the physical portion of Schrödinger’s theory, the more repulsive I find it…. What Schrödinger writes about the visualizability of his theory “is probably not quite right”; in other words it’s crap. When Einstein has criticized quantum theory he has done so from the basis of dogmatic realism. [We should] abandon all attempts to construct perceptual models of atomic processes. In Physics and Beyond (1971), 76. [Heisenberg's seminal 1925 paper initiating quantum mechanics marked] one of the great jumps—perhaps the greatest—in the development of twentieth century physics. In Abraham Pais, Niels Bohr's Times: in Physics, Philosophy, and Polity (1991), 276. Cited in Mauro Dardo, Nobel Laureates and Twentieth-Century Physics (2004), 179. 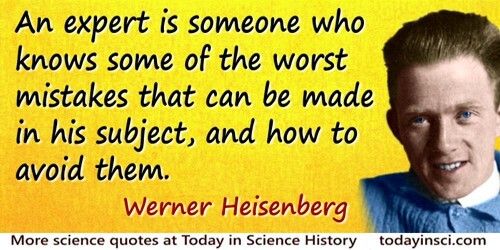 It’s the Heisenberg principle. Me asking the question changes the answer. On caution collecting opinions from advisors to refine decision-making. As quoted in Michael Lewis, 'Obama’s Way', Vanity Fair (Oct 2012). 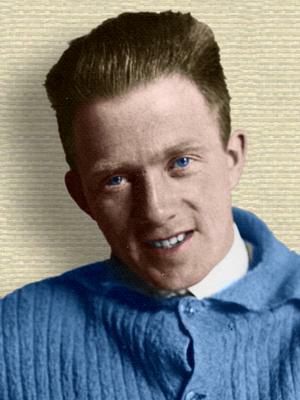 5 Dec - short biography, births, deaths and events on date of Heisenberg's birth.